Football Career: Youth Career: Liverpool (1988-1990); Senior Career: Liverpool (1990-1999) 272 appearances, 46 goals; Real Madrid (1999-2003) 94 appearances, 8 goals; Manchester City (2003-2005) 35 appearances, 0 goals). National Team: England U21 (1991-1993) 7 appearances, 1 goal; England (1994-2001) 37 appearances, 3 goals. Steve McManaman is a retired footballer who is regarded as the most decorated English football player to have played for a club abroad. 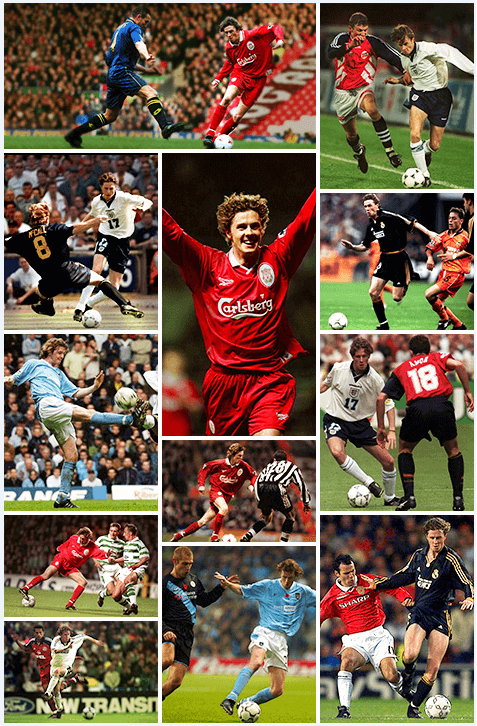 Fondly called “Macca”, he played for Liverpool, Real Madrid and Manchester City. He was cited by UEFA who said none was as successful as him amongst all England’s footballing exports in the modern era. McManaman made history by becoming the first player without first-team experience to play for the England Under-21 team. In his nine years as a professional at Liverpool (1990-99) where he dazzled fans with his speed and dribbling skills, he won the FA Cup and League Cup. And after 364 appearances and 66 goals for Liverpool, he moved to Real Madrid in 1999, becoming just the second English player to ever play for the La Liga club. He played for England in the 1998 FIFA World Cup and in the UEFA European Football Championships in 1996 and 2000. He was capped 37 times for the Three Lions. It was in 1996 when he earned praises from fans and Brazilian football great Pele after coming up with a series of impressive match-winning performances for England. Pele hailed McManaman as the tournament’s best player and lauded him as among the best players in the world at the time. As a Real Madrid player, McManaman won two UEFA Champions League titles, two La Liga trophies, two Supercopa de España medals, one UEFA Super Cup and one Intercontinental Cup, thus firming up his reputation as the most successful English footballer to perform abroad. He moved to Manchester City in 2003, before retiring in 2005. After his retirement, he embarked on a new career in television and is presently with BT Sport where he is one of its leading football pundits. And only recently, Macca became the latest Dafabet Ambassador who will be bringing in his wealth of football knowledge and expert analysis for Dafabet players throughout the season!